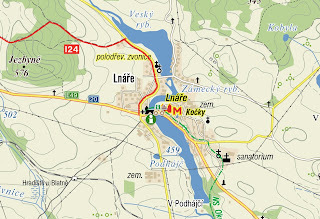 Lnáře lies in Southern Bohemia in the Strakonice district. It is surrounded by wonderful landscape - the village itself is located on river Lomnice, where system of ponds was created in the past. There are two dominants of the village, a castle (chateau) and a fortress. Both are opened to public and if you plan a visit there, I recommend to find some time for these two dominants. The first written notice about the village comes from 1318 when its owner, Habart from Lnáře, is mentioned in the land property documents. There already was a fortress and a parish church in the beginning of 14th century so the village was a natural centre for the surroundings. This fact made it quite important as there was a trade tracks passing through the village. The fortress was rebuilt several times but even this fact it wasn't able to provide comfort to its owner. Therefor the landlord decided to build a new mansion - the old one was not demolished but left as it was. Today it's renovated and very beautiful, as you can see on the photo below. 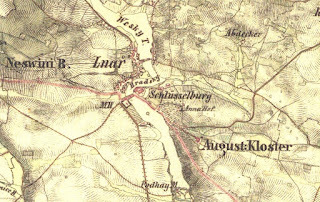 Lnáře was center of a domain till the administrative reform in 1848. Two censuses from this domain are available online in Třeboň digital archives. There are also two chronicles available online in Třeboň, but only in Czech language. Map from 2nd military mapping (1836-1852, source: Mapy.cz). 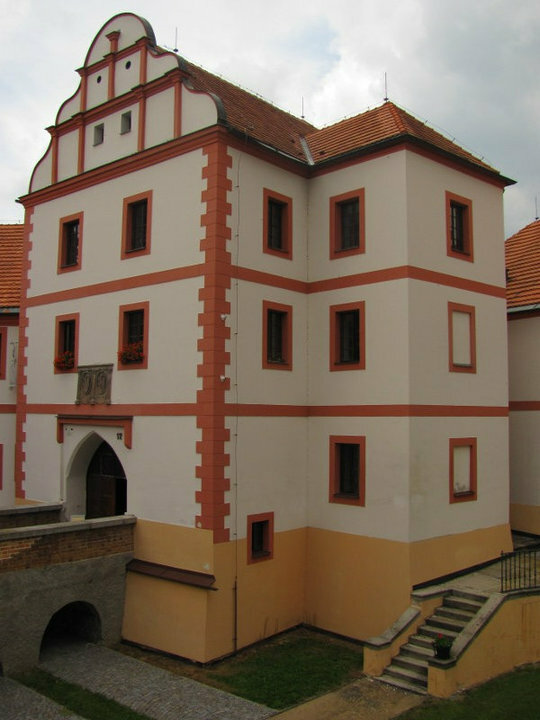 Lnáře belongs under State Regional Archives in Třeboň and under SRA Plzeň. It has its own parish since 1787 (SRA Třeboň) and the parish books are available online till 1911 (births), 1895 (marriages) and 1884 (deaths). It belonged to Kasejovice parish (SRA Plzeň) between 1624 and 1787. The census of Lnáře domain from 1845 shows following surnames in Lnáře village (not in alphabetical order, but as listed in census): Sladký, Wiesner, Beran, Seifert, Mendel, Zika, Ottenweller, Teplický, Krejčí, Schneidinger, Stegel, Konopka, Schorna, Salák, Douša, Kovilka, Fiala, Pech, Váně, Zach, Polák, Pomahač, Hahn, Pech, Bierhansel, Modr, Mach, Wunsch, Kerber, Fröhlich, Schnabel, Bláha, Engelmann, Klepsa, Honzík, Spirk, Zouplna, Ješina, Obermann, Dlouhý, Pátek, Viták, Chmelík, Klecán, Gerner, Čejka, Zbauer, Nos, Šimůnek, Novák, Ráž, Kott, Beneš, Pivnička, Brejcha, Šiška, Mašek, Kulík, Hájek, Vavřík, Král, Bouše, Čadek, Dušek, Sedláček, Ruth, Vacík, Průcha, Kalista, Viktora, Cízl, Staněk, Loučka, Holzknecht, Balík, Podroužek, Bílý, Šíma, Jánský, Augustin, Kohout, Janda, Zelenka, Jiřinec, Prokopius, Benedikt, Červenka, Suda, Líbal, Blecha, Busch, Kaiser, Neuner, Zralý, Lnářský, Marek, Vondrák, Smetana, Vlas, Grasinger, Skuhravý, Harbáček, Horn, Václavka, Štěpánek, Kovář, Adamec, Tůma, Krůta, Klenz, Blažka, Hofmann, Poláček, Strenzel, Karlík, Hilkon, Pek, Pobuda, Kos, Molenda, Moisel, Solner, Lehejček, Brunner, Špachman, Provazník, Suchý, Potřeba, Chaloupka, Vlasák, Louka, Mašík, Lhoták, Mentberger, Franz, Líbal, Michl.